Some Texas lawmakers are hoping that the third time’s the charm for a bill that would allow handgun owners to carry without a license, the Fort Worth Star-Telegram reported. State Rep. Jonathan Stickland (R) recently filed H.B. 357, the “Constitutional Carry” bill, which would no longer require gun owners to complete the process for a handgun license in order to carry their weapons in public. Stickland had filed similar bills in 2015 and 2017, but both failed to make it to the Texas House floor. Aren’t Texans already allowed to carry without a license? Citizens are allowed to carry long guns — not handguns — in public without a license under the “Right to Keep and Bear Arms” provision of the Texas Constitution. “Every citizen shall have the right to keep and bear arms in the lawful defense of himself or the State; but the Legislature shall have power, by law, to regulate the wearing of arms, with a view to prevent crime,” the Texas Constitution reads. Marsha McCartney, a spokeswoman for the Texas chapter of the Brady Campaign to Prevent Gun Violence, told the newspaper that the majority of Texans would not be in favor of the law. McCartney also pointed out that Stickland narrowly won his re-election bid with just under 50 percent of the vote against his Democratic opponent who had 47.40 percent. 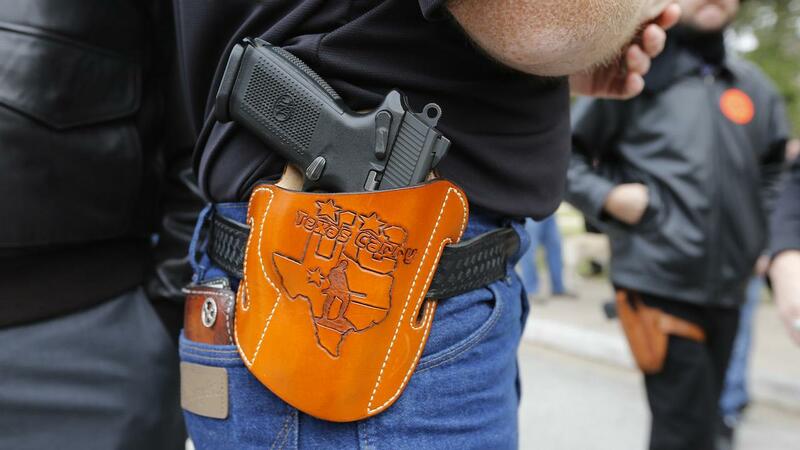 After the 2017 bill died, “we made a decision, as much as we can, to help Texas pass Constitutional Carry next year,” Gun Owners of America chairman Tim Macy said during the Republican Party of Texas state convention this summer, according to the Star-Telegram. Macy said he believes the 2019 bill will get more traction from Republicans and Democrats in the 86th legislative session, which begins Jan. 8. “They understand that when you have to pay a fee and take a test for your rights, that’s hurting minorities more than anything else,” he said. Strickland also believes it will make it through the House this time around.